I have a serious issue with spam comments in my wordpress blog and I’m sure many of you do as well. 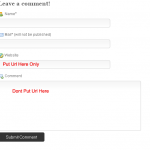 I have this blog setup to stick all comments into a que until i can approve or deny them. I hate having to spend so much of my time doing this. I almost need to hire someone just to remove blogger spam comments. How to Write Good Spam Content Let me start off with saying I hate content spam. Some of the replies I get with links in them are just awful. If you are going to spam someone at least read the article, and at make sure what you are writing is (in this case English) in some remotely proper and related comment.